In January of 2017, Chad Hustings wrote a blog post, Isotopes, Nuts, Bolts and Eggs, about an activity some colleagues and I had shared in a workshop at BCCE in 2016. With encouragement from many ChemEd X readers that wanted to try the activity for themselves, I am sharing more details and a student handout. "Each group of students then received a bag of about 10 “isotopes” (eggs) and were asked to measure the mass of each (the eggs were numbered for accounting purposes). Students discovered that about six of the isotopes “eggs” were the same mass, two were lighter and two were heavier. They were asked to put these in groups, to choose one isotope or egg from each group and look inside. Each of the eggs (isotopes) had the same number of black nuts but different number of the silver or non painted nuts. Now here is where the background information started to kick in. The black nuts were analogous to protons and the silver ones were analogous to neutrons. Students were even able to take the “average” masses a variety of ways and discovered that the weighted average was most similar to their data. This is the first isotope activity I have tried where the students can look inside the model that resembled the atom and find information that reinforced what an isotope actually is. Furthermore, the quantitative data forced them to examine beliefs about different types of averages and what the numbers really mean. This took a bit to set up but was inexpensive and can be used year to year." Although this activity has gone through a number of iterations as we have tried it for about two years, we would like to hear feedback from those who try it. We welcome comments and suggestions for improvement. About 30-40 minutes for the activity. This depends on how many balances are available to share and how many different isotopes are made for a single element. We had 5 balances for 12 or 13 teams of two students. Students can work in groups of 3 as well. Enough plastic Easter eggs to make 5 or 6 sets of about 12 eggs. small nuts and bolts to serve as protons and neutrons. The number of each of these depends on your choices of elements. We made boron, silicon, titanium, hydrogen, magnesium, etc. See the Student Handout in the Supporting Information at the bottom of this post for more specific steps that guide students to a new understanding of isotopes. Students obtain a collection of eggs. These eggs represent atoms that make up their “sample”. Students observe and identify what eggs might be of the same type. After weighing each egg, there should be groups of eggs that will be the same (or very similar) masses. Each group of similar masses represents one isotope. Usually there are at least 2 different isotopes and then the students are asked to open one egg from each isotope to count the numbers of protons and neutrons. This allows them to identify the element and the isotope and write the isotope symbol for each group. Using the number of eggs for each isotope and the total number of like colored eggs, students can calculate the % abundance for each isotope. Then, using the atomic mass and % abundance, students can determine the weighted average atomic mass. NOTE – of course this average atomic mass will not be the same for the average atomic mass of the element on the periodic table but the goal of the exercise is showing that the number of neutrons gives differences in mass. Also, the student data in the teacher document you will find in the supporting information will look different if you choose to represent other elements/isotopes. We purchased plastic eggs and nuts in bulk online. There is small variation in the masses of individual eggs and nuts and we’ve tried to standardize that with the procedure. Once the teacher collects the materials, there is painting time (15 mins one side then 1 day for drying, flip and paint other side another day to dry) and then maybe a couple of hours to figure out which isotopes to use, and count out for the eggs, depending on how many sets are made. Important NOTE: USE A 1-DECIMAL PLACE BALANCE, this helps to mask the variations in the manufacturing of the eggs and hardware. We made sets of 12-18 eggs of one color to represent an element and tried to use real elements and their abundances (boron, silicon, titanium, hydrogen, magnesium, etc) and so had about 5 or 6 different sets of a dozen or so colored eggs. 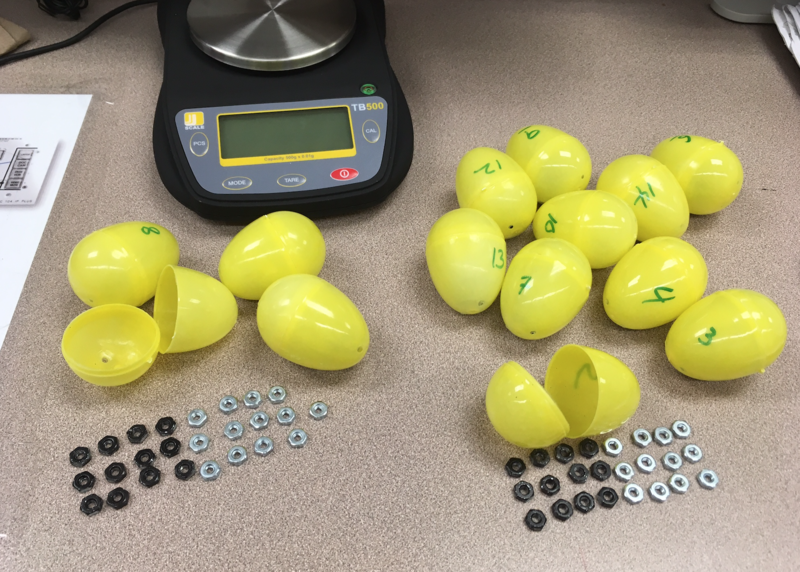 We used small nuts and spray painted some of them black (protons) and left the others unpainted (neutrons) and filled each egg with the appropriate number. In trying to mimic the actual abundances, there would be a few eggs (sometimes only 1 or 2) that would be heavier or lighter than most. We also numbered each egg since they needed to weigh each one and this was easy to keep track (first table). I must give credit to Brian Aldrich, creator of this activity, with modifications from the rest of us in chemistry at Delta College. Thank you for sharing the materials!! I'm really looking forward to using this activity. Thank you again.